Where would I find the circuit breaker for my converter? I have shore power to the coach battery but none to the chassis battery. I know that there is a breaker for it, but I cannot locate it anywhere. Galen, some converters will have the AC panelboard and circuit breakers built in to the converter itself. Other motorhomes will have a separate panelboard distribution box mounted individually and isolated from the converter. It just depends on which brand of converter you’re coach manufacturer utilized in the design of your rig. Circuit breakers will always be mounted in the distribution panelboard regardless if they are incorporated into the design of the converter or in a stand-alone panel. But rarely will the converter charge both the house DC system and the engine starting battery. Typically the engine battery only receives a charge from the alternator while driving. However, some of the newer, sophisticated, three-step chargers do have a separate charging circuit for the engine battery but this is not usually the norm. Because the AC and DC systems are vastly different, the only common component between the shore power and the house battery system is the converter. You should find a 120-volt AC circuit breaker that protects the AC portion of the converter, and also a DC auto-resetting breaker that will protect the converter output, as well as fuses to protect each DC branch circuit. 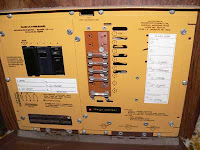 That AC breaker you are searching for will be inside the converter or at the separate panelboard distribution box. The DC breaker (or fuse) can be anywhere in the system. To find the converter, start by searching inside all the interior compartments or by listening for a clicking noise whenever the coach is plugged into shore power. The integral relay is sometimes audible as the system switches between battery power and converter power. Once found, look for the AC section (if a combo unit), or keep searching for that panelboard distribution box. It’s there somewhere!